Coating Thickness Gage - A handy and robust gage for easy and fast coating thickness measurements -for all paint and automobile applications. 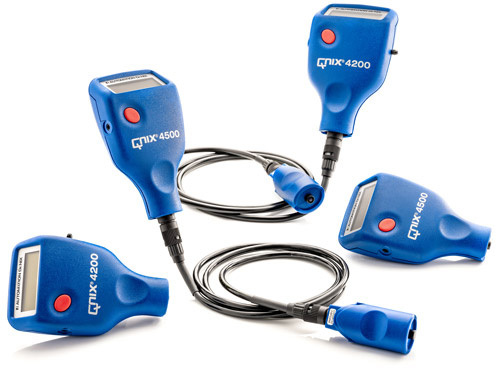 Now available as cable Probe and with increased measuring range! 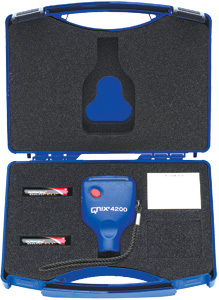 QNix® 4500 was developed for a broad spectrum of use in the automobile and painting industries. This compact gage allows for extremely accurate measurements of paint and corrosion protection thicknesses, both on steel and iron as well as on non-ferrous metals such as aluminum, zinc or copper. Extremely precise - High measuring accuracy over the entire measuring range. Simple operation - No calibration. One button only. One-hand operation. Innovative technology - Proven Hall sensor and Eddy Current technology. 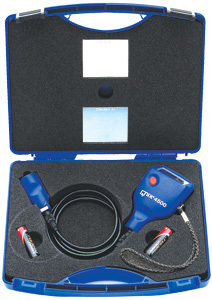 Broad spectrum of use - Dual probe for measurements on steel and non-ferrous metals. Protective measuring - Polished ruby tip to protect both the probe and the surface measured. Gage for standard applications - easy, safe and fast measurements. One-hand operation. Only one button. High precision over the entire measuring range: Fe 0-5000 µm and NFe 0-3000 µm. Broad spectrum of use for non-destructive measurements on steel, iron and non-ferrous metals such as aluminum, zinc, copper and brass. Proven technology: Hall sensor and Eddy Current technology. Acoustic signal confirms taking of a measurement. Wear-proof ruby probe tip for long-term use. Large clear numbers for optimum readability. Precise display of readings, battery condition, mode of operation and serial number. Fe* Measuring of non-ferroumagnetic coatings on ferromagnetic substrate, for example measuring on steel- or iron-substrates. NFe* Measuring on non-ferromagnetic and electrically non-conductive coatings (insulating coatings) on non ferromagnetic and electrically conductive substrate, for example measuring on aluminum-, zinc-, brass-, and certain stainless (high grade) steel substrates.